Here’s the makan list again! A little shorter than last year’s list. So many food cravings, so few days. Since I’ve moved to the graduate students apartment 3 years ago, I’ve been running or walking around the cross-country trail at least once a week, I’ve also taken the shuttle bus to and from the main campus many times a week. But I don’t understand how I could have not noticed the wild raspberries ripening among the many many wild raspberry bushes along the trail and the road during the previous summers. How could I have missed them the past 2 summers? I only started noticing the wild raspberries when someone pointed it out to me during a hiking trip early this month. And then, all of a sudden, I’m seeing them everywhere. They are everywhere along the trail. People are parking their cars haphazardly along the road just to pick free raspberries. I’ve even picked and ate a few. Why didn’t I notice the wild raspberries before? It’s perplexing and somewhat troubling. Anyway, we saw a snake during the hiking trip. Many problems not deliberately caused by people or by lack of knowledge, but by lack of compassion. #1: Emotional Human Value (Things that support a happy life). #2: Promote harmony among different religious traditions. With a calm and peaceful mood, things will work out well. Calm mind will lead to good health. Good sleep, don’t have to rely on pills. Good digestion. Calm mind will lead to peaceful harmonious home. DL talked about sometimes his calm mind also gets disturbed: When I sleep, sometimes mosquitoes come. My relationship with mosquitoes not that good. Every 10th of March since 1959 (the day he left Tibet), DL said that he gets worried and experiences sadness, doubts and uncertainties. Calm mind so sleep never disturbed. Calm mind is a very good thing. Calm mind not due to indifference but a calm, sensitive, sharp mind. Compassion, loving kindness builds inner strength. Our survival depends on others’ care (e.g., a mother’s love). Baby feels secure. Mother’s physical touch important. DL quoted research about baby monkeys separated from their mothers do not thrive, are weaker and prone to illnesses. Biological factor has nothing to do with religion. But that compassion is biased because it depends on the action of others. That compassion can reach only friends and not enemies. 2. True compassion extends to our enemies. True compassion can solve all conflicts. Destroy an enemy, you lose a friend. 20th century is a century of war. What’s happening in the 21st century is due to resentment from the 20th century. No matter the goal, non-violence is the method. Non-violent method has no side effect. 21st century should use dialogs. We need disarmament, both external and internal. God is blessing with love. God means infinite love. But these approach is only for believers of God which is about half of the population in the world. Non-believers think love and compassion is for the religious. Non-believers think money money money. Money does not equal happiness. Must not neglect inner value. Ultimate source of happiness is within us. Faith comes from religion which comes later. Affection comes from birth. The thought that practicing compassion is good for others but not necessary for our ownself is totally wrong. I do not smile at dog. They do not appreciate. During car ride, I smile at human being, the person wonder why I smile. It brings more suspicion to others. Practice of compassion first benefit oneself then others. Value of affection, not my teacher, but my mother. We survive because of our mother’s care. We all have same potential to develop warmheartedness. Please think more. If you find nothing interesting, then forget it. 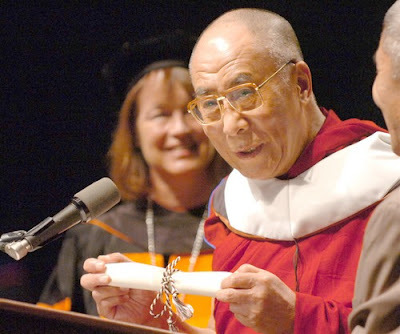 After the Question and Answer session, DL was conferred the honorary doctorate in humane letters. During his acceptance speech, DL said that he is a Hopeless Professor because (1) his knowledge is limited to one area and (2) he is lazy (lazy to grade homework). 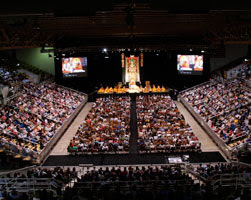 The Dalai Lama is at Lehigh for a week-long teaching. I was a volunteer at today’s public lecture on “Generating a Good Heart”. Since tickets for the public lecture is sold out, being a volunteer is the only way I get to hear his talk. I took copious notes. It’s not easy to understand him. Aside from his accent, he forms his sentences differently, which is quite typical of non-native English speakers. He also had his own translator beside him helping him out. After the public lecture, there was a Question and Answer session with preselected questions. I tried to keep to his words but sometimes that may not make any sense, so I edited some parts of it. 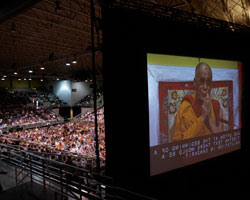 Question 1: If you were not the Dalai Lama, what life would you pursue? DL: That question no interest (laughter, pause). Most probably engineer, engineering. Question 2: Why do you think there’s so many people suffering from anxiety and depression in the U.S.? DL: Wrong person to ask, should ask American (laughter). People always want something new and something more. People have big mission (DL makes a circle with his hands), life becomes boring but still have to go that way (gestures round and round the circle). Excessive consumerism (DL gave example of Japan 20 years ago). Your economy, your lifestyle, you’re the richest nation. Material values, there’s limitation because you want more. Without content, too much competition, ambition, self-centered, everything blame others. Gap between rich and poor (DL gave example of pockets of poor people in Washington DC). This is morally wrong. Practically, this also cause many problems. All external problems can never be solved. Change our attitude, we get more peace. (DL gave example of an old Tibetan story about covering the earth with leather in order to cover every thorn that pricks us. It is easier to cover our own small soul instead of covering the whole earth). Unrealistic expectation. If there’s no way to overcome, no use to worry. If Buddhist, blame on karma (laughter). If believe a creator, then blame God (laughter). Question 3: Is it possible to exist as a sovereign nation with a policy of non-violence? DL: That one quite complicated. Sovereignty, complete independence, not relying on others…that reality gone. For example, US economy depend on others. I always admire European Union, small countries that used to fight each other, now working together as one entity. This question very complicated, I don’t know. Question 4: What do you think is needed to help all the children of the world? Education. Secular not separate from religion, but secular equals to religion. Question 5: What is your advice in the world of rising religious fundamentalism? To discuss similarities and differences. Investigate the differences. They’ll find that the differences is different method with same goal. Go to different Holy places (DL talked about his pilgrimage to Jerusalem). Buddha is teacher, not God. (DL said that sometimes he is required to teach Christians about God and it is very difficult because he is a believer of a non-theistic religion). 4. Leaders of different religion come together speak with one voice…peace. Mischievous people among the different religion: Islam, Christianity, Hinduism, Buddhism. These people (terrorist) cannot represent their religion. Since September 11, I’m trying to reach out to Muslims. The 15th DL provided to the Muslims in Tibet…. (the translator corrected DL that it is the 13th not 15th) (DL chuckled) 15th DL not yet come, when come? I don’t know. It must have been the realization that my “carefree” days in the US is almost coming to an end that made me sign up for the beginning jazz dance class. Jazz dance is another thing that I never thought I would do. Unlike spinning, this class requires me to work physically and mentally. Memorizing the steps, counting the beats, keeping up with the rest of the class, trying to not stand out like a sore thumb (believe me, it’s easy to look awkward when you move right as everyone else is moving left). But it’s a forgiving class since there is quite a large number of never-danced-before students. I’m enjoying the jazz dance class. 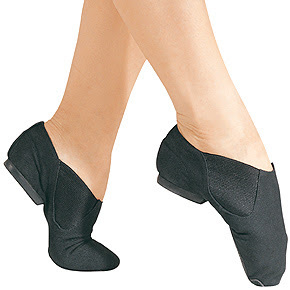 I even bought a pair of black leather slip-on jazz shoes 🙂 I just need to put aside any inhibitions, try my best and not worry about how I look. It’s funny how the Chinese dance culture evolved to become a performance-only activity. In Africa, dance is part of life. It’s not a teenage-thing. It’s not a clubbing-thing. It’s not a sexual-thing. It’s not a taboo-thing. My African friends dance at every single party: weddings, birthdays, baby dedications, graduations. It’s like laughing: everyone laughs when they hear or see something funny. So is their dancing: everyone dances when they are celebrating. There’s no awkwardness. There’s no good or bad dancing, just like there’s no good or bad walking/sitting/breathing. Spinning (Indoor cycling): I absolutely love it. I’m not sure why I like it so much. During spinning, I have to physically work really hard, but at the same time, the rhythm of the cycling movements is very relaxing. It is also a relatively “easy” form of exercise. Since I am controlling the resistance of the spinner (stationary bike), if it gets too tough, I can turn down the resistance or cycle slower. And there’s no choreography or movements to memorize (such as those in dance or aerobic classes). Spinning is definitely less strenuous than running. Running is hard. I think I have given up on running. I started running just to push myself to do something that I never thought I would do. Even though I ran consistently for many months, I don’t think I really enjoyed running. I was slow and it was really tough mentally and physically to keep going and going. Oh, did I mention that I was in extreme pain after my first spinning class? And the extreme pain lasted 4 days! My legs (especially my thighs) hurt so bad. It was painful to stand up. It was painful to sit down. It was painful to walk. It was painful to go down the stairs. It was painful to get into my car. I could hardly sleep because of the pain. I never imagined cycling could cause such intense chronic pain. Thankfully, the pain went away after 1 week. Now spinning is pure enjoyment. However, it’s hard to sell spinning to my friends. I tell them it will hurt like crazy for 1 week but they will really like it after that. But my descriptions of my extremely painful week must be scaring them off. Answers: What will it cost you?